Published by the Rhodesian Services Association as part of a major historical record. "The text, pictures and illustrations, combine into a volume that is now a benchmark for regimental histories." As the 19th century and Queen Victoria’s long reign drew to a close, volunteer squadrons of the Rhodesia regiment, recruited by Colonel Baden-Powell, were positioned along the border with Bechuanaland, to defend Rhodesia against Boer aggression. In 1914 Rhodesians again rallied to the Crown with the formation of two battalions of the Rhodesia Regiment to counter the German presence in South West and East Africa. Shortly after, many volunteered to join the Allied forces on the Western Front. During the Second World War the indomitable combat prowess and leadership talents of Rhodesia Regiment volunteers were strongly evident in many theatres, including North Africa, Somaliland, the Middle East, Italy, the Adriatic, Western Europe and South East Asia. In 1947 the Crown bestowed the ultimate accolade, with the title ‘Royal’ prefixed to the regiment. Through the 1950s and ’60s, the experiences of Rhodesians in successive areas of conflict—Malaya, Suez, Aden and Nyasaland—significantly enhanced aspects of Rhodesia’s territorial army, particularly with regard to counter-insurgency warfare. Conscription ensured combat-readiness for the growing number of battalions and independent companies established throughout the country, providing a solid basis for the regiment to play a vital role in countering the ZANLA/ZIPRA guerrilla insurgencies of the 1960s and ’70s. Coordinated by Hugh Bomford, this definitive history has, over a period of seven years, been compiled by a core group of dedicated people, with over 400 other contributors. Thousands of illustrations complement the in-depth text, with several appendices covering rolls of honour, honours and awards, leadership rolls, intake records, and uniforms and embellishments. 56pp full colour appendices for Honours and Awards; Uniforms, Embellishments and Equipment. This is a privately published book recording the life of Lt Gen Keith Coster. In August 2015, the late former-commander of the Rhodesian Army (1968–1972), Lt-Gen Keith Coster’s son, Steve, and daughter-in-law, Cindy, approached Gerry van Tonder, wanting to know if h would like to take custody of personal memoirs, photographs, letters, certificates, records and some items of uniform that had belonged to the general. It was their wish that the collection find a permanent home in a Rhodesian museum. Suffice to say, Gerry readily accepted their magnanimous offer. In return, he promised them that he would construct a fact file on the military life of the general, so that a permanent record could be established. The full-colour, coil-bound, 265-page publication mainly comprises information and photos that have never before seen the light of day, let alone be published. 1963, it was a natural progression for him to transfer to the Southern Rhodesian Army. In 1968, and with the rank of lieutenant-general, he was appointed general officer commanding of the Rhodesian Army, a post he held until his retirement in 1972. He then went back to South Africa, where he spent thirteen years serving as a ‘civilian officer’ in the top national security organs of that country, for which he was bestowed with South Africa’s highest award, the Star of South Africa. When purchased we wil send you the MPEG file by email attachment. $5 per tone Email for more information and details of how to purchase. 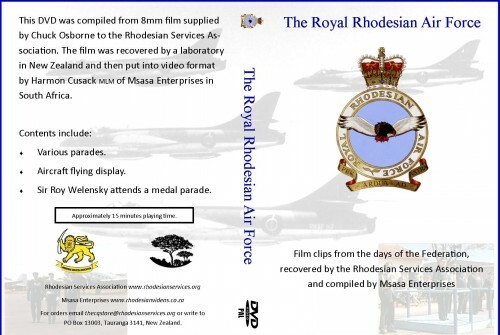 The Royal Rhodesian Air Force - film clips from the Federation days includes various parades, aircraft flying display, Sir Roy Welensky. Run time approximately 15 minutes. DVD PAL format. The original 8mm films were donated by Chuck Osborne to the Rhodesian Services Association who funded the recovery and conversion to digital format by Park Road Productions which is connected to Sir Peter Jackson and the Weta Group in Wellington NZ. Harmon Cusack MLM of Msasa Enterprises in South Africa then put it to DVD format for us free of charge. This footage was professionaly filmed. It has no original audio track, Msasa have put musical track as a background. The resultant picture quality is good considering the age of the material. There are some good aerial views of Salisbury. A great piece of unique history. The See-Saw Years (27 minutes run time) was a film produced by the Central African Film Unit in around 1962 with the assistance of the Tobacco Export Promotion Council of Southern Rhodesia and the tobacco farmers of Umvukwes. It is a light hearted look at the development of farming in the area. The original film was donated by Steve Addison to the Rhodesian Services Association who funded the recovery and conversion to digital format by Park Road Productions which is connected to Sir Peter Jackson and the Weta Group in Wellington NZ. Harmon Cusack MLM of Msasa Enterprises in South Africa then put it to DVD format for us free of charge. A Reason To Care (20 minutes run time) is a documentary format look at conservation and game integration into Rhodesian farming. Made in the 1970s with the cooperation of the late Norman Travers and others. Full sound track on both features. A great historic package. 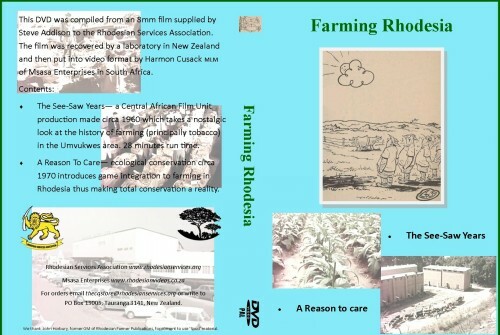 We thank John Horbury former GM of Rhodesian Farmer Publications for the use of the 'Spud' cartoon material used on the cover design.